The Isle of Islay is part of the Southern Hebrides and is inhabited by approx. 3200 people. 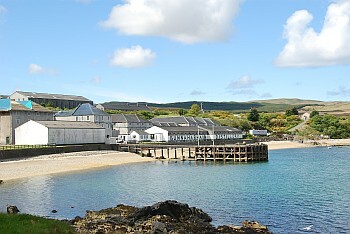 Islay is famous for its eight whisky distilleries. The first written references come from St. Columba who set foot on Islay in 560ad close to Kilchiaran Bay on Islay’s Atlantic west coast. The historical significance of Islay cannot be over emphasised. It is from Finlaggan, the cradle of the Clan Donald, that much of Argyll was ruled by the Lords of the Isles. Here, in the ancient burial ground is the grave of Robert the Bruce’s grand-daughter, and there is a seasonal visitors’ cottage on-site. For many visitors the famous distilleries on Islay are the first acquaintance with this hospitable and friendly island, and many of them find out that Islay is so much more than malt whisky and become returning visitors for many years. The Isle of Islay offers the visitor a peaceful and relaxing holiday with miles of beautiful beaches, impressive bays on Islay’s Atlantic west coast and stunning views. Pony Trekking, fresh and salt water angling, shooting and stalking are all available, while walking and cycling are ideal and practical ways to explore the island. Islay is also a birdwatching paradise with more than 100 species of birds and the thousands of migrating geese who visit Islay in the winter from the Arctic. 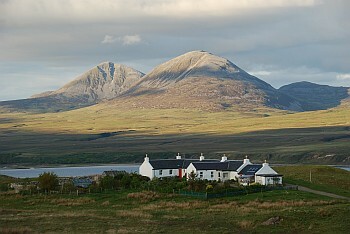 Not without reason Islay is called “The Queen of the Hebrides”. Below the seas surrounding Islay lie many wrecks which provide interesting dives for the experienced diver. Islay boasts some quality hand craft shops which are worth visiting, such as the Persabus Pottery in Port Askaig and the Islay Woollen Mill outside Bridgend. Islay House Square in Bridgend, located in the centre of Islay, is home to Islay Ales, the Islay Quilters, Elizabeth Sykes Batics and several other interesting shops. The neighbouring Bridgend woodland is perfect for fine sheltered walks along the river Sorn, specially in springtime when the grounds are covered with bluebells. A pleasant journey of a little over two hours will take the visitor from Kennacraig on the Kintyre peninsula to Port Ellen or Port Askaig. The two ferries are operated by Caledonian MacBrayne since the early 1970s and sail several times a day to Islay and onwards to Oban on a Wednesday. Islay has its own airport, Glenegedale, located between Port Ellen and Bowmore, and is used several times a day for scheduled flights from Glasgow. The Islay bus will take visitors all over the island running several scheduled services. Cars can be hired at D & N MacKenzie, Tel: 01496 302300, and there are several places on the island where bikes can be hired. Daytrippers will find the islands of Jura and Colonsay within easy reach from Islay. It is from Port Askaig that regular ferries cross the Sound of Islay to the Isle of Jura, a pleasant 10 minute crossing which brings the famous Paps of Jura within reach. Port Askaig is also the port where the ferry to Colonsay leaves which will give the day-tripper six hours on this beautiful little island. 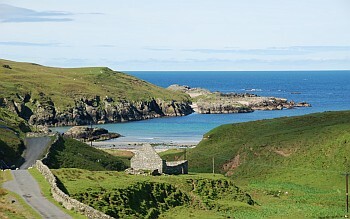 We start the tour at Port Ellen with it’s lovely picturesque white houses all around Leodeamus Bay. Port Ellen is the second largest village on Islay and home to Port Ellen Maltings, several restaurants and shops. Opposite Kilnaughton Bay is the Oa peninsula, a remote and now deserted part of Islay where in early days 4000 people lived. Remains of old villages are the witnesses of these forgotten days. The Oa is a habitat of several rare species of birds and the Chough have their own protected are here. We now take a little detour and follow the coastal road to the southern Distilleries, where Laphroaig and the Friends of Laphroaig land are the first of the three famous distilleries. The second one, Lagavulin, is just one km away from Laphroaig and last but not least is the Ardbeg Distillery, home to the Old Kiln Cafe, a good place for lunch. The road passes Kildalton with it’s famous high cross and chapel, and ends just beyond Claggain Bay at Ardtalla. A straight road runs From Port Ellen to Bowmore, also referred to as ‘the Low Road’, which means there is a High Road as well and it runs parallel to the low road. On the road to Bowmore are Islay’s airport at Glenegedale and the famous Machrie Golf Links, just behind the Big Strand, a 9km stretch of beautiful sandy beach. On entering Bowmore the first obvious buildings are some of the warehouses from Bowmore Distillery on the left, followed by the lovely and unique Bowmore Round Church, built in a circular shape so the devil couldn’t hide in the corners. Bowmore is Islay’s administrative capital and situated on the shore of Loch Indaal. Bowmore Distillery, the oldest on the island, is located in the heart of this lovely village, next to the Mactaggart Leisure Centre which comprises a superb swimming pool, sauna and fitness gym open each week from Tuesday to Sunday. Our next village is Bridgend, the centre of Islay and home to Islay House, built by the Campbells in the 1700s and Islay House Square which hosts Islay Ales, the Islay Quilters, Elizabeth Sykes Batics and several other interesting shops. Opposite the square are the Bridgend Woods offering sheltered walks along the river Sorn. We now head for Port Askaig and pass the Islay Woollen Mill, worth a stop to admire the wonderful fabrics made here. The owner will gladly show you around the place. The road continuous through fertile meadow lands passing Islay’s only Dairy farm and passes the old mining town of Ballygrant. Just outside Ballygrant is Finlaggan, home of the Lords of the Isles who once ruled the western part of Scotland and Argyll. Not far from here is a road to the left taking you to the Persabus Pottery and the Bunnahabhain Distillery. The Caol Ila distillery is located close to Port Askaig which lies on the banks of the Sound of Islay and is the second port of Islay, recently renovated to provide better facilities for both the Islay ferry and Isle of Jura ferry. From Port Askaig it’s back to Bridgend and we now head for Bruichladdich, following the shore of Loch Indaal and the raised beaches. The shores are a feeding ground for many wading birds and offer several parking spaces to stop and enjoy Islay’s wildlife. 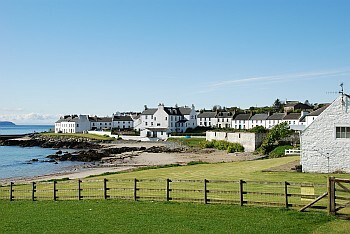 Bruichladdich is a distillery village providing homes for the distilleries workforce. Just before Bruichladdich is a single track road heading for the Atlantic west coast with its beautiful bays such as Saligo Bay and Machir Bay. North of this road is the famous Loch Gruinart and RSPB visitor centre. Loch Gruinart is home to almost 45,000 Geese that spend the winter here and feed on the grass lands before leaving in late April. A short and pleasant drive of 10 minutes will bring you in Port Charlotte, Islay’s most beautiful village, and home to the Islay Museum which is built in a former church building, the Islay Natural History Trust and the future home of Islay’s ninth distillery, The Port Charlotte Distillery. In the heart of this picturesque village is a road over the Rhinns of Islay towards the west coast which passes Kilchiaran Chapel, the Cultoon Stone Circle, Lossit Bay and ends at Portnahaven and Port Wemyss. Two little fishing villages, laying side by side on the most southerly part of Islay. Islay Ultimate Online Guide Information about the Isle of Islay, in the southern Hebrides. Includes photographs, past and present, details of popular activities on the Island, distillery listings and a selection of tourist information for visitors. Maps of the Island are also provided, together with details of wildlife, climate and Islay’s historic carved stones. Islay Blog The Islay Blog is a source of news, events, and background information (history, wildlife, genealogy, and so on) on the Isle of Islay.